Tweet Fits my Goetz endpin perfectly and works great! Tweet Give a listen to it here. Tweet To J. in my private studio. The student is now co-principal of the Chicago Youth Symphony. Hard work pays off! Changing a string is not just changing a string. To play or not to play…the ink. That is the question. How Tight Should Your Bow Hair Be? Tweet Here’s a quick arrangement I did of Kool and The Gang’s “Celebration” for bass quartet. I don’t want to be a lapsed member any more! 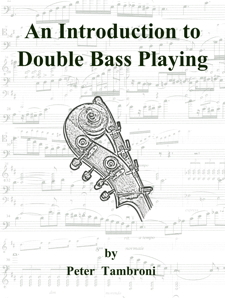 What’s inside “An Introduction to Double Bass Playing”? Tweet Check out a short video I did on teaching beginning upper string players the bow hand.